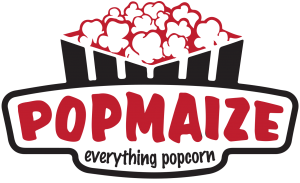 Pop Maize - the #1 popcorn resource online! The microwave oven has been a staple in kitchen convenience since it was invented in the 1940s. It has allowed us to heat up left-overs, a lifetime supply of ramen noodles and — you guessed it — popcorn! Microwavable popcorn bags, while they provide us with a vast amount of convenience when it comes to preparing popcorn, are loaded with additives, preservatives, and for some, unwanted sodium and saturated fats. Not to mention the bags themselves only add to the torrents of trash in our ever-growing landfills. So, how can you appreciate the convenience of your microwave oven, the pure tastiness of your popcorn, and produce less waste in the process? 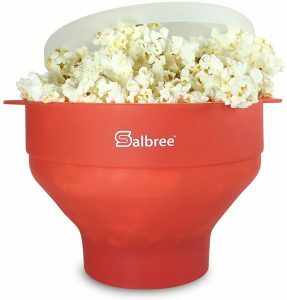 It’s simple — the Salbree collapsible microwave popcorn bowl! Let’s take a look at how this popcorn bowl will increase the quality of your popcorn experience! Straight out of the gates, the Salbree doesn’t disappoint with it’s plentiful yield. It can pop a maximum of ½ cup of kernels at one time, which produces 3 quarts of deliciously naked popcorn that you can customize however you want. Along with its substantially greater output than that of microwavable popcorn bags, it also features measuring lines in the bottom of the bowl for both ¼ cup and ½ cup amounts. So you don’t have to worry about searching your kitchen drawers for those measuring cups every time you want to enjoy a heaping bowl of scrumptious heavenly popcorn. It also doesn’t require you to use any butter or oil. This means that if you fancy your popcorn on the healthy side, you can enjoy it just how God intended — unadulterated and pure as can be! However, if you prefer your popcorn lathered in butter and salt, or smothered in caramel and molasses, then this popcorn popper will allow you the absolute freedom to prepare your crispy decadent puffs exactly as you desire. No need to stress about those pesky additives and preservatives that are strewn about those store-bought bags of popcorn! Worried about those old-maids taking up all the space in the bottom of the bowl? No need to worry! This popcorn popper gives you loads of your precious popcorn without leaving behind torrents of unpopped soldiers. When it comes to food, the other side of the wonderfully scrumptious coin is cleaning up the mess you made in order to put the food in your belly. Well, with the Salbree, cleanup is easier than ever and requires little to no effort. With it’s open design and silicone composition, all it requires is a wipe down with a washcloth and warm, soapy water. If you prefer not to get your hands dirty, then you can simply place it in the dishwasher and let it do all that work for you! The Salbree is dishwasher safe, and is made of BPA free materials so that you don’t have to worry about coming in contact with any potentially harmful chemicals. One of the pinnacle aspects of this device, if not the apex itself, is it’s staggering simplicity. With a small base that blossoms into a wide and open top, it gives users plenty of space for their popcorn to fill up the bowl without spilling out all over into the microwave. It comes with a loose-fitting lid that raises with the popcorn as it is heated — allowing the kernels room to breathe and pop as needed without burning and turning into dusty pieces of charcoal. Along with this, it is also fitted with two handles on either side so that you don’t have to worry about fetching the oven mitts to protect your hands when you are retrieving it from the microwave. When it comes to the material used, it is made of silicone based materials. Making it pretty much imperishable. It also is collapsible, which means that storage is not an issue. Considering this, it is perfect for college students, travelers, or those who have don’t have a lot of room to spare in their kitchen. Sounds pretty awesome, right? But wait — there’s more! As far as quality goes, you are getting a top notch, high quality product for just under $20.00 on Amazon. Meaning that you no longer have to worry about spending unnecesary dollars on overpriced bagged popcorn every time you want to enjoy it. Simply purchase your kernels in bulk at your local grocer for whenever you are craving tasty popcorn! You can also enjoy your popcorn guilt-free with the knowledge that you are not throwing away bags every time you make it. The Salbree gives you more popcorn, for less money, and you produce less waste in the process! Now that is what I call efficient! The Salbree is also avavailable in a wide variety of colors — 12 to be exact! From formal black and white, to vibrant teal and royal purple, you can choose just the right bowl that will complement your kitchen wares perfectly. Again, the name of the game with this popcorn popper is simplicity. With it’s compact, simple, and streamlined design and vibrant color variations, it is easy for anyone and everyone to find the one that is perfect for them and their loved ones. Long story short, the Salbree delivers considerably in every realm. It promises a bountiful yield, convenient storage, beautiful coloring, and simplistic innovative design all for the low price of $16.90. So, if you are feeling like changing it up and treating yourself to a handy appliance specifically for all of your popcorn needs, this product is the one for you! Are you a business owner who wishes to increase his/her yields, or a popcorn connoisseur with a seemingly endless appetite for crunchety, crispety, nostalgic bits of butter-smothered heaven? Well, then the PopHeaven commercial-grade popcorn machine by Great Northern Popcorn company is most certainly the appliance for you! Let’s take a gander at how this beastly goliath of a popcorn popper stands apart amongst the rest and compares with other commercial machines. Whether you are cooking popcorn in your man cave for poker night or selling it in the lobby of your up-and-coming business, one of the most important factors — if not the most important — is how much popcorn the machine can pop in one sitting. With the PopHeaven popcorn machine, you are investing not only in outstanding quality (which we will get to later) and engineering, but you are ensuring that every time you fill the kettle and flip the switch, you are provided with enough popcorn for seconds, thirds, and fifths. It is fitted with a 12-ounce kettle, meaning that it produces an astonishing 5 gallons (80 cups) per batch. To put this in perspective, one microwavable bag of popcorn contains 13 cups of popcorn at 6 ½ cups per serving. That is more than 6 times the amount of popcorn than that in microwavable bags! Since this machine is composed of heavy-duty powdered stainless steel and tempered glass, it is simply a breeze to clean. All it requires to get it looking shiny and good-as-new is a wipe down with a warm and wet washcloth. Of course, if you feel like taking your time and using hot soapy water to give it a deep clean when the machine is turned off then that works just as well. For most individuals, washing things by hand seems so archaic — especially with the development of dishwashers. However, if you are one who likes the look of shiny things and enjoys keeping his/her appliances clean and operational, then cleaning up your PopHeaven popper will be a walk in the park. Luckily for you, it is a popcorn machine, meaning that the only messes you primarily need to worry about are oil, butter, and unborn kernels that get raked into the old-maids drawer. As such, there is no arduous scrubbing and sanitizing needed in order to keep it looking like it was freshly manufactured. As mentioned earlier, this particular device is composed of heavy-duty, powder-coated stainless steel and high-quality tempered glass. It’s cubical shape is spacious, simple, and effective and provides your popcorn with ample space to pop around freely.. The PopHeaven also runs on 1,350 watts — meaning it requires a substantial amount of juice to operate. However, once it is operating it runs smoothly and efficiently with little-to-no hang-ups. The machine is fitted with three functional switches which control the spot light warmer, the pot-stirrer, and the pot-heater. These switches give the operator greater control over the whole of the heating process and the machine itself. Along with the electronic superiority and exceptional chassis, it is equipped with a 12-ounce kettle and metal gears. 12 ounces is far more than most domestic popcorn appliances, and as such, is perfect for small business owners with a knack for yield inflation. The metal gears are a godsend because while plastic gears might be sufficient with stovetop poppers or electric oil poppers, they would buckle under the sheer weight of 5 gallons and constant activity. To top it all off, it features a fold-down hatch that opens to the main chamber for preparing, scooping, serving, and cleaning. In the bottom of the main chamber are perforated openings that allow for the old-maids to fall through into a convenient tray located directly beneath the main chamber. With this, you don’t have to worry about breaking your teeth on unpopped kernels in the midst of stuffing your face during your favorite part of the movie. Simply rake the unpopped kernels along the bottom of the appliance and watch them fall through into their secret chamber below. Now, let’s talk about the quality of the PopHeaven. As it says in the name, it will take you straight to pop heaven. While some customers have reported issues with the product, the majority of consumers are very content and satisfied with the responsiveness of their popcorn popper. First, the composition. With heavy-duty, powder-coated stainless steel, you are guaranteed a sturdy and sleek piece of machine. Not to mention, it is adorned with tempered glass — meaning it can withstand high temperatures and a little scuffle here and there. With it’s metal gears, 12-ounce kettle, and 1,350 watt capability, I would definitely say that in purchasing the PopHeaven commercial-grade popcorn popper you are investing in a consistently pop-tastic experience. You can count on this lovely apparatus to provide you with movie-theater-quality popcorn nearly every time you use it. I say “every time” because in the world of consumerism there are bound to be hiccups here and there with any product. It all starts with a glance. Whether you are shopping online or perusing through the aisles of a K-Mart, your purchases usually begin with your eyes. As such, let’s take a look at this beauty and how it will catch your eye. For beginners, it’s chrome-colored, stainless steel frame is elegant, sleek, and modern. This, coupled with the tempered glass panes, makes it stand out to those looking for something more contemporary — as opposed to the models that closely resemble the original machines that you could expect to find at a Dodger’s game back in the day with your ol’ man. However, it isn’t entirely contemporary. One of the great features of this appliance is the artwork that is very nostalgic and reminiscent of old ball games and family evenings at the theater. This particular model is adorned with a soft, blue banner on the front that reads, “Popcorn” in all capital letters and a silly ad-like font. Along with this, are several sub-headings on all four sides of the apparatus — all displaying different descriptors of popcorn such as: delicious, fresh tasty, and so on. On either side of the copy on every panel, are little popcorn characters jovially gallivanting about and playing a variety of musical instruments. Apparently nothing goes with popcorn better than some tunes. So, what do you think? The PopHeaven brings exquisite, contemporary design, functionality and operation to the table, as well as semi-retro aesthetics to create a capable and good-looking popcorn popper. It’s yield far surpasses that of other machines, and it’s high-grade compositional materials make it sturdy, reliable, and ultimately long-lived. With that being said, if you are looking to further entertain your patrons at your family-owned retail store, or your newly bought movie theater franchise, look no further than the PopHeaven by Great Northern Popcorn to provide you with the reliability and and delicious that you are looking for. For those who prefer to enjoy their popcorn in a healthy and affordable manner, the Presto 04820 PopLite Hot Air Popper provides users with a fast, reliable and delicious product — additive and preservative free! We will see just how much pop you get for your buck with this #1 Amazon Bestseller and weigh its profile against that of other hot air poppers! This model by Presto produces 18 cups of hot, crispy, fluffy popcorn in just 2 ½ minutes and does so without all those pesky preservatives and additives that are commonly found in microwavable popcorn bags. The Presto 04820 pops approximately 30-percent faster than other hot air popper brands and does with virtually zero unpopped kernels. This wonder-appliance is compatible with both regular and gourmet popcorn kernels, which means that you can potentially save up to 70-percent in comparison to what you would spend if you were purchasing leading microwavable popcorn brands. On top of the high yield and short amount of time with which it is produced, you also are getting a product that is unadulterated and tainted with loads of saturated fats and extra unneeded chemicals, meaning that what you put in, is what you get out. This leaves a large gap for you to fill with your creativity and taste-preference, and ultimately giving you complete freedom to enjoy your popcorn how you truly desire every time you make it. Though it produces a hefty amount of popcorn in a convenient time span, it is highly advised by manufacturers and other customers that you do NOT fill the kernels past the featured fill-line. If you do, there is a good chance kernels will get burned; leaving you with blackened popcorn, a smoky kitchen, and an unhappy tummy. Not to mention, the appliance will actually shut off in a fit of gluttonous rage in response to too many kernels. In short, be patient and be nice to your Presto! Though the clean up after preparing a tasty batch of popcorn isn’t particularly awful, the cleaning experience can certainly be somewhat of a stifling agent in the whole culinary experience for some. Luckily, the Presto 04820 requires little-to-no clean up with its clean popping process and seamless delivery. For the most part, all this ingenious popper requires is a little wipe down with a damp washcloth or wet towel to fetch out the lot of fallen kernels that got left behind and whatever toppings you add during the the popping process to ensure optimal popping efficiency… Now that doesn’t sound so bad! This nifty appliance is a white cylinder complemented with vibrant yellow accents and topped with a bee-yellow measuring cup for butter and other toppings. It is also built according to North American Electrical standards, making it widely available for purchase and accessible in use. Being an electrical appliance, it also features plastic hooks on the back side of the machine, allowing for compact storage of the power cable and less clutter. Since it is built for quick and easy popcorn popping, there is no ‘on/off’ switch and the product warns that if you run the machine without any kernels in it you can potentially damage the machine and melt the practice cover. While this may be an inconvenience for some who prefer the ease and comfort of such a switch, for those who don’t mind the lack of this luxury will be greatly pleased. While it has a handy little measuring cup on the top of the cover which can be used to melt butter to add to the popcorn, it is advised by multitudes of customers to soften or even pre-melt the butter before placing it in the measuring cup for further heating and melting. This is because the popcorn pops in a very short amount of time and does not produce enough heat for long enough to thoroughly melt cold butter. You may also notice that when the frenzy of gunfire sprouts from the machine, it may begin with sending out a few unpopped stragglers before the lot of the masses, however, if you aren’t easily bugged by minor discrepancies then this will just be another part of the experience and not a hindrance. First off, it is an Amazon #1 Bestseller; that says quite a bit about the success of the product in and of itself. Next, is its affordability. This specialized appliance provides popcorn fanatics and health enthusiasts with a knack for tasty, fluffy puffs of heaven, with virtually no unpopped kernels, timely delivery, and easy operation, all for $18.83. For less than $20.00 you get popcorn any way you want it in less than 3 minutes! Though there have been accounts of select customers jimmy-rigging the appliance to better suit their needs — putting foil over the chute to prevent stragglers from escaping before the battle of the kernels begins — customers seem to find this appliance satisfying, convenient, and suitable. One thing to consider, for those who are very particular with what they prefer, is that the State of California requires that this product advertises the fact that it does contain a potentially carcinogenic chemical that allegedly attribute to birth defects, even though its presence in the product is quite miniscule. The Presto 04820 is sleek in its simple colors and cylindrical, tower-like shape. The colors are bright and positive, meaning that when you bust it out in your kitchen it will pop and stand-out apart from the rest of the decor strewn about the space. It is so simple, that doesn’t even have an ‘on/off’ switch. While for some, this could take away from the appeal and beauty of this machine, for some it is the simplicity that really drives it’s attractiveness. All in all, the Presto 04820 Hot Air Popper is a wondrous machine. It gives popcorn beginners and popcorn professionals alike, a fast, simple, clean and healthy way to prepare popcorn in just minutes with the freedom to prepare the snack however they desire. 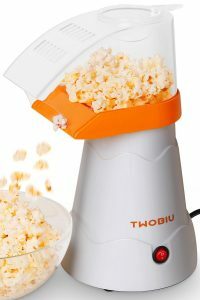 With its positively bright coloring, timely delivery and affordable price, this popcorn popper is definitely one that I would highly recommend for those who are serious about their popcorn and want a separate appliance, or for those who are simply curious about the other methods with which they can enjoy their favorite snack! When you are in the moment wrist-deep in a bowl of butter-doused, salt-dusted popcorn, the obvious is answer to this question is, “NO!” Hoarding handfuls of crispy goodness and wearing kernels in your teeth as if you are Lil Jon has never felt so right. It is moments such as these when microwavable popcorn just doesn’t cut it, and you may be wishing had your very own industrial popcorn machine. Well, look no further than the Great Northern Popcorn Roosevelt Top Antique Style Popcorn Machine — woo hoo! Let’s take a look at how this popcorn popper holds its own and rises above amongst the rest. 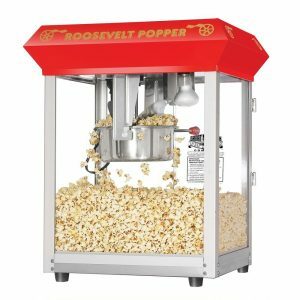 The Roosevelt Top Antique Style Popcorn Machine by Great Northern Popcorn provides users with a stainless steel 8 ounce kettle and produces roughly 3 gallons of popcorn per batch. As you can probably imagine, 3 gallons is quite a heaping cartful of popcorn. Whether you are preparing this tasty concession for the lobby of your family-owned tire shop or the break room at the office, this popcorn machine will provide you, your family, and your friends with an ample amount of tasty popcorn without making endless trips to the microwave for single-serving bags of microwavable popcorn! With being a goliath of a machine, one may be inclined to think that it would be hell to clean up, however, with the Roosevelt Top Antique Style Popcorn Machine, this is not the case. Being made of heavy-duty powder coated stainless steel and tempered glass paneling, this machine requires a simple wipe down with a damp washcloth or some all-purpose cleaner to remove any smudges, debris or oil streaks left behind. It also features a plethora of small perforations in the main deck to allow for the old maids (or unpopped kernels) to fall through into the tray below. After you raking all the unpopped kernels so that they fall through the perforations, simply pull out the tray, scoop out the old maids, give ‘er a good wipe down and she is ready for another batch. It is as simple as that! This commercial quality machine operates on 860 watts, requires minimal assembly, and combines all of the best features that modern popcorn technology has to offer. It provides users with a stainless steel food-zone, a stainless steel kettle, a built-in warmer light, and includes exclusive components such as the old maids drawer and the heated warming deck. The deluxe model features a 3 position control switch, as opposed to prior models which operate on 640 watts and offer a simpler 2 position control switch. The 3 positions allow for control of the spot light warmer, stirrer and pot heater, and the heated warming deck. Meaning you are in control of every aspect of your popcorn popping experience one hundred percent of the time! The cart is complete with 18” ball bearing wheels for optimum mobility and easy transportation of your machine and it’s delicious popcorn. In the cart is ample space for storage of popcorn bags, popcorn, and any other accessories you wish to tote around with your popcorn popper. Along with the cart, an optional hand-lift and push-rail is included free of charge. Along with it’s superior design and sturdy construction, it also has the ability to easily detach from the rolling cart making it perfect for countertops or some extra space in your garage. If you are in the market for a commercial-grade popcorn machine, then you are inherently looking for the best quality in all realms of popcorn popping. At $290.02 for both the cart and the machine on Amazon, you are making an investment that will last you ages and will provide you with optimal performance and quick-and-simple popcorn production with minimal effort and attention. Being made of heavy-duty powder coated steel and complete with tempered glass panels, this machine is designed and constructed to withstand wear and tear from both indoor and outdoor environments and high-frequency usage. Though for the layman it may seem expensive, for the popcorn fanatic or business owner with knack for customer service, it is a godsend considering it’s affordability and exceptional compositional quality. This machine combines both the latest modern popcorn preparing and serving technology with nostalgic aesthetics that are sure to remind you of the movie theater, the carnival, or a good ‘ol day at the ball game with your grand-pappy back in the day. The popper is opaque silver with transparent glass paneling and is topped with a bright cardinal roof that houses the lights and control switches. The cart comes in the same red color and is fitted with two small shelves for easy preparation and serving. Wherever there is red, there is the addition of gold laced text and old-style copy that will add flare to any space or event. The wheels of the cart are complete with gold rims and spokes that complement and enhance the overall beauty of the machine and are sure to catch the eyes of any passersby! After this in-depth scrutiny of the Great Northern Popcorn Roosevelt Top Antique Style Popcorn Machine, I have to say, I am very impressed with it in every aspect of it’s delivery and performance. Though it is quite expensive in comparison to domestic popcorn poppers, for those who are enthusiastic about the tasty American favorite or the small business owner, this popper is steal! Made of high quality materials, complete with every feature you could ask for, and versatile in it’s capabilities to provide portable popcorn services as well as that suitable for static environments with less movement, this popcorn machine will provide you with torrents of deliciously perfect popcorn in just a matter of minutes with minimal cleanup and assembly, and will turn heads with it’s beautifully reminiscent exterior and modern approach to popcorn production. When popcorn pops into many of our minds, we think of attending the ball game back in the day with pseudo-circus music and dudes adorned in funny-looking hats tossing out boxes of cracker jacks amidst hordes of happy Americans enjoying their favorite past-time. Well, with the Nostalgia SP300 Retro Series popcorn popper you can feel like you have traveled through time as if you are going to watch Babe Ruth himself at the stadium! Let’s take a look and see how this popcorn popper stands out among the rest and holds its own! The Nostalgia SP300 comes straight out of the gate with a whopping 6 quart popping capacity! In other words, it produces 24 cups of delicious, hot, crispy popcorn in just a handful of minutes! Considering other brands of this kind of popper, 6 quarts is a substantial amount of popcorn per batch, and in comparison to microwavable popcorn bags, it is nearly double the amount of one bag of popcorn, and without all of those pesky unwanted additives and preservatives! Not only does it produce 6 quarts of sinfully hot and fluffy popped corn, but it does so however you wish to prepare it! While Nostalgia does provide pre-prepared kits of popcorn which are made specifically for their brand of machines, regular kernels that can be bought in bulk are also valid. Simply add oil, salt, kernels, and watch ‘er pop! This popcorn popper comes equipped with an easy-to-clean non-stick cooking plate, making the cleaning process a whizz! No hard scrubbing or soaking in hot, soapy water to get this sucker clean! Simply wipe it down with a warm, damp washcloth or sponge, let it dry, and watch it shine! While the clear, dome-shaped lid that also works as a serving bowl may fit in your dishwasher, it is quite fragile and is highly recommended that you hand wash it in order to ensure longevity and optimal performance! Though it has an infrastructural design that is quite similar to other popcorn poppers, it still brings a reliable and efficient design to the table (or countertop) that will keep you coming back for seconds (and thirds)! Unlike some, it does not have an on/off switch and thus, simply requires that you plug it in to start the heating process. For some, this is a huge inconvenience, but if this lack of modernization doesn’t bug you then it will please you just fine! 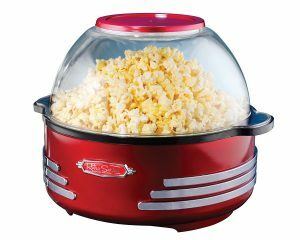 It is fully armed with a motorized stirring arm that rotates and circulates the popcorn kernels — ensuring that you get the most out of what you put in! In fact, it allows for 25-percent more kernels to pop than most popcorn poppers and it does so without burning the living heck out of your precious popcorn! The transparent lid doubles up as a serving bowl, but has been said to be quite fragile if handled without care. So, it is efficient in its dual-purpose capabilities, however, this capability can be swiftly diminished if lack of care is exhibited with the lid and will require you to call the manufacturers and possibly have to buy another one. Be cautious and handle with care! Along with all of these features, it also comes with cool-touch handles so that you can go from popping your delectable popcorn to serving it without batting an eye! No need to wait until it cools down with this baby! This model in particular is $39.29 on Amazon because of its retro design and appeal, but in terms of the inner-workings of the machine itself, it isn’t too different from other Nostalgia models. Yet, despite the lack of sturdy construction with the lid/serving bowl, you are most definitely getting a high quality popcorn product that will provide you with movie-style popcorn from the comforts of your own home for less than $50.00! You certainly can’t complain about that! The Nostalgia SP300 comes in a retro design, meaning that it looks like it came straight out of a time machine to provide you, your family, and your friends with traditional movie theater-style popcorn in just minutes! It comes in a deep crimson hue that is reminiscent of carnivals and circuses from back-in-the-day and has three chrome strips that wrap around the appliance — making it look like a jukebox that came straight out of Grease! The silver stripes meet in the center in an offset pattern, bringing your attention to the ‘Retro Series’ logo placed front-and-center! The lid is also fitted with a plastic cap similar in color for allowing excess kernels to escape during the heating process to prevent burning and claustrophobia for the popcorn before they are consumed by you and your compadres! On the bright side, this popcorn popper looks great, works great, and produces an ample amount of popcorn in a just a few minutes with only a little preparation beforehand! Not to mention, it lives up to its name Nostalgia with its retro 50’s design and beautiful coloring! So, if you have a thing for 50’s aesthetics and delicious popcorn, this popper may be something that you should look into! The popularity of microwavable popcorn has been on the rise since the microwavable popcorn bag made its debut in the late 20th century. However, as awareness in the realm has escalated, so has people’s demand for healthier and faster methods to consume their favorite tasty treat. As such, the Lekue has personified this desire and demand for such technology and delivers such in an affordable and extremely convenient manner. Let’s take a look and see how it compares to others in the genre! The Lekue microwavable popcorn popper is geared toward personal use, and as such, provides a much smaller yield than other popcorn poppers of other styles. However, for those who are looking to make popcorn for themselves when they are having a night in with their fluffy companions or significant other, this nifty popcorn popper is perfect! Simply put ¼ to ⅓ cup of kernels in the bottom of the bowl with your choice of oil or butter and place the bowl in the microwave for 2 minutes and watch the magic as nearly every single kernel is popped without any burning or leaving any old maids behind! If more than the recommended amount of kernels is used, then there is a possibility that the Lekue bowl won’t be as effective and more kernels will go unpopped! So, don’t get too hasty and be patient with your Lekue popcorn popper! Since the Lekue microwave popcorn popper is a bowl with a lid, there aren’t multiple little parts that need cleaning or maintenance! Making this appliance a dream-boat for those who don’t like to clean! Not only are there less parts to clean, but the parts are made of food-safe silicone which keeps the butter, oil, and other toppings from sticking to the bowl! When you are finished, simply hand-wash with hot soapy water or place it in the dishwasher if you don’t have the time! If there is one word to describe this entire product, it is: simple. This bowl is available in bright red and is made of food-grade, food-safe silicone, ensuring that the popcorn you eat is healthy and safe to eat, every time you eat it! Being silicone, this product is also virtually indestructible and is easy to clean! Not only does the silicone make it easier to hand-wash if you so choose, but it also makes it dishwasher safe! Along with the silicone bowl, it comes with a loose-fitting lid that you place over the kernels before popping, as they start to pop the lid will begin to rise and allow the popped kernels to fill the bowl without escaping and filling up your microwave! Speaking of silicone, did I mention that this bowl is collapsible?! This means that when it comes time to put the Lekue away, you don’t have to worry about it taking up unnecessary space in your cupboards or worse — sitting on the countertop! With this collapsible feature, one can tuck this appliance away in any nook and cranny of the kitchen without having to reorganize the whole kitchen! The Lekue microwave popcorn popper is a high-quality product and provides users with a popcorn making process that is so simple that it almost feels like cheating. Not only is it manufactured with silicone and comes equipped with a loose-fitting, high-quality plastic lid, but you get all of this, plus it’s uber-intuitive design for only $19.98 on Amazon! 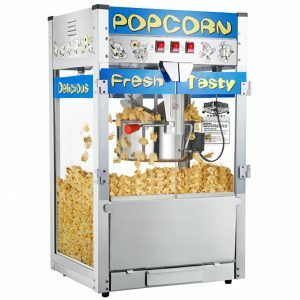 So, whether you enjoy popcorn seldomly, or whether you are addicted to the salty buttery goodness that are the erupted husks of the popped kernels, this handy dandy appliance will provide you with the simple and effortless means to pop your own popcorn in a timely and customized manner with hardly any extra variables to let you down! Though microwavable popcorn bags are typically loaded with preservatives and additives, which can be quite a hindrance for some, this microwavable popcorn popper allows for users to enjoy the timeliness of the microwave and the luxury of personal preference! You add your own kernels, put in your own toppings, and in the end you get your own popcorn, exactly how you want it! If you decide down the line that you want to take your popcorn game to the next level and purchase something with a little more pow!, then you can use your Lekue bowl as an extra apparatus for holding and displaying other goodies at your next fiesta! 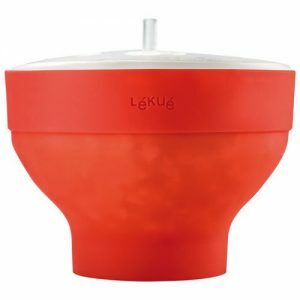 The Lekue microwavable popcorn popper comes in a beautifully vibrant red and is so simple that it will boggle your mind without even trying! 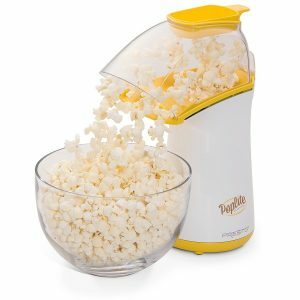 This microwavable popcorn popper is one of the top listed items in its category on Amazon, meaning it is popular with the masses — and for good reason! It is made of food-grade silicone which is a major plus for most people, especially those who find themselves concerned about all the extra pesky chemicals and additives that are strewn about food products nowadays. It also comes in a pretty color and is sized so that it fits in virtually any and every type of microwave available. On top of this, it is only $20.00 on Amazon, meaning it can not only be used in nearly everyone’s microwave oven, but it can also be purchased by almost everyone as well! It can be hand-washed or placed in the dishwasher for easier convenience, and uses popcorn that can be purchased in bulk which means that you get a delicious and out-of-this-world product without all of those preservatives and extra thing-a-muh-jiggers that you get in microwavable popcorn bags. All in all, I would say that if you love popcorn, and you love it in a fast, easy, efficient, and healthy manner, this popcorn popper will not do you wrong! The Great Northern 6 ½ quart original spinner is a simply designed appliance that provides the user with a manual popcorn-making experience and a satisfying end-product. We will examine and analyze this product and see just how well it stands on its own and how it compares to other popcorn makers of the style! In comparison to other stovetop poppers, the 6 ½ quart original spinner is one of the largest available. With such a large kettle, you can prepare 6 ½ quarts of deliciously light and fluffy popcorn in just 3-5 minutes! If you put too many kernels in, the stirring mechanism can jam and make your popcorn popping experience somewhat lackluster in terms of what it could be. Be patient and take your time in learning how to best operate the stirring mechanism so that you can maximize the amount of popcorn you can prepare in one sitting without burning or leaving bunches of kernels behind! One of the highlights of this product is the easy clean up! Since it is put together with simple engineering, there aren’t a bunch of tiny nooks and crannies that need to be deep cleaned with micro-cleaning technology. Instead, you simply need to wipe it down with a paper towel or a damp wash cloth and watch as it shines! Even though it would be nice for this appliance to disassemble for dishwasher cleaning, it isn’t necessary and does not require extensive cleaning! Being a stovetop popper, the overall design is quite simple and straightforward. It is a heavy-cast aluminum pot topped with a double-ventilation lid that comes fitted with real wooden knobs on both sides of the lid. It is also equipped with an authentic wooden crank that operates the stirring mechanism. Though aluminum is an excellent conduit for convection, it is flimsy and lightweight in comparison to other poppers which are made of stainless steel. So be sure to treat this popper with care and don’t thrash it around! The stirring mechanism is simply two rotating wires that sit directly above the kernels and allow for circulation and redistribution of heat throughout the kettle, which allows for maximum popping potential and diminishes the chance of burning. While some customers have complained about the flimsy nature of this stirring mechanism, others have exclaimed that it works exceptionally well considering its simple design and merely requires patience and finesse. The gears which allow for the the stirring mechanism to effectively operate are made of very sturdy plastic. In comparison to other stovetop popcorn makers, the plastic gears are much less practical and effective than the alternative metal gears that are readily available by request from the manufacturer or through buying another model or brand of stove top popper. While most customers expound their gleaming satisfaction with this appliance and don’t seem to have any problems with the plastic gears, some have declared that the gears are easily jammed and the stirring mechanism stops spinning frequently throughout the stirring process. However, supposedly this problem is easily overcome by using less kernels to avoid jamming. Since it is made of aluminum, there is some speculation that it isn´t good to use on electric stoves, however, this one does indeed work on induction stove tops, which makes it quite versatile and usable for people of all appliance preferences. Since it is made of aluminum and uses plastic gears, I wouldn’t say that it is of the highest quality in comparison to other stovetop popcorn makers. Considering that there are others that are made of stainless steel and feature metal gears as well as more sturdy stirring mechanisms, this certainly requires a good amount of finesse in taking care of and operating the product. However, many customers say that it works just fine and simply requires a small learning curve and some patience and that these two things will allow for the popcorn popper to last much longer and work more effectively. In regards to its pricing, I suppose you are getting exactly what you pay for. Since it is only $22.20 on Amazon, you can’t really expect to get a hearty, stainless steel appliance complete with sturdy metal gears and a top-of-the-line stirring mechanism. So considering the price, you certainly get what you pay for. Yet, according to customer’s testimonials, this appliance provides you with timely movie-theater-style popcorn in a fast and easy manner without all the pesky preservatives and additives that you would get with microwavable popcorn bags! This stovetop popcorn maker is perfect as a gift for anyone who thoroughly enjoys popcorn or even for yourself to have as an auxiliary appliance at home! Despite its lack of sturdy hardware in this particular model, there are other brands and options that feature a stainless steel body and metal gears as opposed to the aluminum and plastic. Yet, if these factors about the design and quality of the materials with which the appliance is made, then this popcorn popper will do just the job it is intended for and will provide you with delicious popcorn however the heck you like it in just minutes! The price is a great selling-point as well! What a screaming deal! You pay $22.20 one time and don’t have to worry about restocking your popcorn bags every day! Unless if you don’t eat popcorn every day…which I have a hard time believing! In conclusion, this product is cost-effective, easy to clean, simple to operate, and while the materials may not be indestructible and damage-resistant, they compositionally create an appliance that does exactly what it is intended to do! 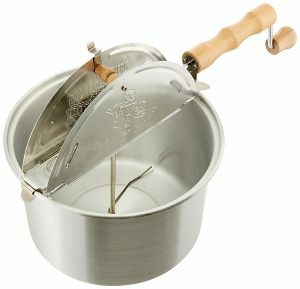 So if you are curious about the process of manual popcorn popping and are looking for a more natural, healthy way to enjoy your favorite concession snack, then don’t hesitate and make your way to Amazon and spend some pocket change on the Great Northern Popcorn Original Spinner 6 ½ Quart Popcorn Popper today! While Cracker Jack is undoubtedly America’s go-to sweet ‘n crunchy popcorn favorite, there are many who love the experience of delightfully sweet popcorn without the presence of peanuts, caramel and molasses. For those outsiders, there was a product introduced that challenged the mainstream culture of Cracker Jack with absurdist humor, unconventional packaging and an all-around easy-going flavor and texture profile that captured the attention of many hard-working Americans. 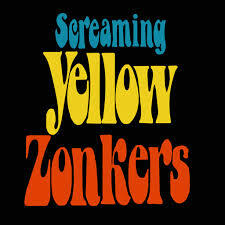 Say hello, to Screaming Yellow Zonkers! 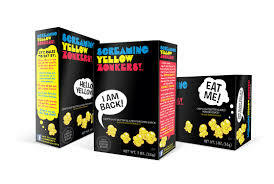 Screaming Yellow Zonkers, or SYZ, as they are commonly abbreviated by their devoted fan base, was popcorn with a yellow sugary glaze presented in a black box produced by Lincoln Snacks in the late 1960’s. The year was 1968; Lincoln Brands, an American snack food company which had provided the public with products such as Fiddle Faddle and Poppycock, had developed yet another product similar to their previous products and were quite unsure of what to name it and how exactly to market and promote it. 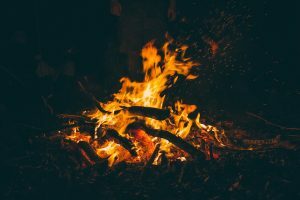 As such, executives journeyed to Chicago and opened their doors to all major ad agencies with the hope that someone out there in the big, bad windy city would have some ideas for a catchy title and marketing strategy for their new creation. 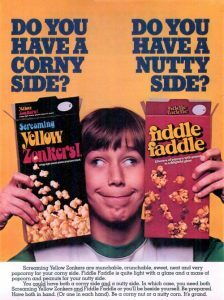 Screaming Yellow Zonkers ad from back in the day. Sure enough, a small boutique agency, Hurvis, Binzer & Churchill won the account with the ever-so fitting title “Screaming Yellow Zonkers” and presented it in a black package with “crazy” copy and wildly obscure illustrations on every panel. Though it is uncertain, Lincoln Snacks claims that SYZ was the first food item to be sold in black packaging. The packaging contained humorously absurdist copy, such as suggestions of what to do with Screaming Yellow Zonkers, or that 8 oz. (226g) = 1/ 4,409 of a metric ton. This comedic relief was written by Allan Katz; an advertising copywriter and humorist who is also known for his works in M*A*S*H and The Mary Tyler Moore Show, and Howie Krakow who wrote the material on the first several boxes of SYZ, as well as the award-winning TV and radio campaigns. While well-known humorists and advertisers were capturing the emotionally attention of customers and passersby, SYZ also involved many world-class artists in their less-than-conventional phenomenon such as the airbrush artist, Charlie White, who illustrated the front of the circus box, while Seymour Chwast’s work covered the rest. The circus box was such an eyeful, that it ended up being displayed in the Louvre in Paris, France! SYZ were primarily geared toward those who enjoyed sweet popcorn, but without a handful of nuts like their nationalist cousin Cracker Jack. The Zonkers were kosher, but they did contain dairy products. Unfortunately, the product was discontinued after food distribution goliath ConAgra Foods bought out Lincoln Foods in 2007. However, as of May 2012, ConAgra is producing them on a limited edition basis for Walgreens. It goes without saying, that Screaming Yellow Zonkers were not only an experience for your mouth to behold, but ALL of your senses as they would entice your eyes with strangely absurd art, your belly with gut-wrenching laughter due to the nonsensical obscurist banter, and emotional stimulation derived of the overall rebellious spirit of this counter-cultural delight. While there are many popcorn brands available today, one that stands out amongst the multitudes of choices is Jiffy Pop. Jiffy Pop is a popcorn brand owned by ConAgra Foods. 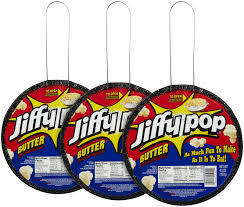 What makes this brand stand out more so than the rest is that while many other popcorn brands rely on the invention of the microwaveable bag and the microwave, Jiffy Pop prefers to keep it simple and reliant on the old-school stovetop method which is supposed to retain more flavor and promise a memorable experience! Despite its competitors being fast and efficient with the microwave oven, the term “Jiffy” refers to the short amount of time with which the popcorn is cooked, which if it can compete with microwave ovens, then that means you are provided with good quality, naturally cooked popcorn lickity split! It is such a simple design, that everyone from a little tot to your grandmother can cook it. Simply turn on the stove, place your Jiffy Pop atop the burner, and let the impatience settle in! Despite its simple nature, it is important not to fiddle with the contraption too much as it can cause the kernels to cook unevenly. At the same time, if there is not enough attention given to the device during the cooking process then the smell of burnt popcorn may fill up one’s home and the fire alarms may begin to start singing incessantly. I’m sure many of us can relate with this lovely smell during our childhood, eh? Frederick C. Mennen, a chemist, inventor, and industrialist from LaPorte, Indiana is credited with the invention in 1958. The product contains corn kernels, oils, and flavoring agents in a heavy gauge aluminum pan with an expandable light gauge aluminum cover. As the pan is heated on the stovetop, the heated popcorn kernels caused the aluminum cover to unfold and puff up creating a balloon-like apparatus full of fluffy, crunchy bliss. 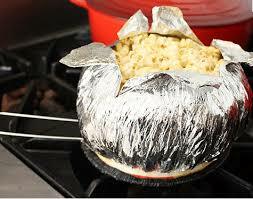 Jiffy Pop is the perfect treat for camping, as it can easily be made over a campfire! Mennen began marketing this fine product in 1959, offering both natural and butter flavors. As a result, American Home Products purchased Jiffy Pop from Mennen later that same year, and within one year’s time, the product was being sold in stores nationwide as it stole the public’s hearts with its simple, safe, and streamlined design. However, the idea wasn’t entirely original as it was based on a similar product design from five years prior by Benjamin Coleman of Berkley, Michigan, and marketed by the Taylor Reed Corporation as E-Z Pop. In the early 1960’s, the Taylor Reed Corporation actually sued Mennen Food Products for patent infringement. The district court ruled for the plaintiff, and found both products to be equivalent to one another. The case was subsequently overturned on an appeal. Eventually, American Home Products split off its food division and renamed it International Home Foods in 1996. In the year 2000, ConAgra Foods purchased International Home Foods and absorbing and attaining control and profit of the Jiffy Pop brand.